Stamford has a wonderful community Hebrew High School program called Kulanu. This trimester, I am teaching a comparative religions class, and the students, primarily ninth graders, have really gotten into it. Two weeks ago we engaged in an interfaith dialogue with teens from a local church - it was one of the most fruitful dialogue sessions that I've ever experienced. No defensiveness, lots of honesty and curiosity, all in the spirit of sharing. The teens came out of it with renewed pride in their own faith and with greater respect for the Other. As my friend Rev. Douglas McArthur remarked later, his teens felt that they had brought the world a little closer to peace and understanding that day. 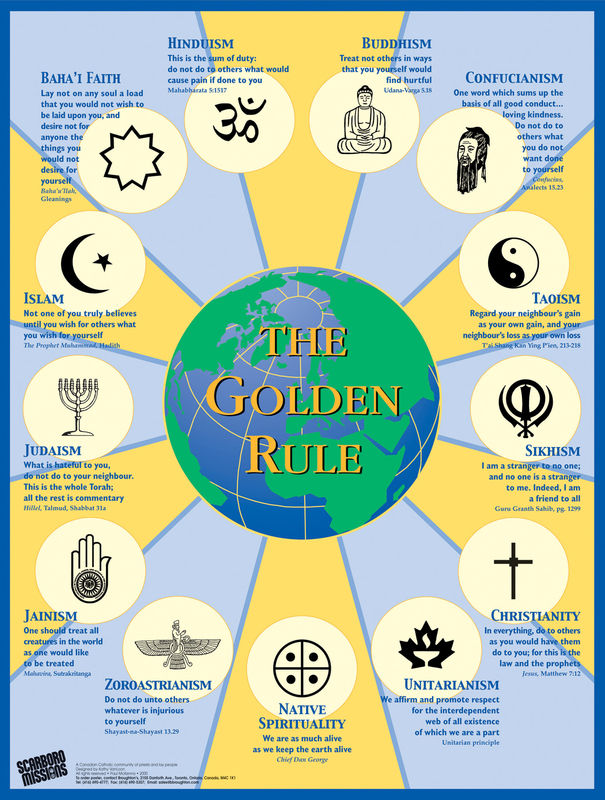 This week, we discussed the Golden Rule and how it manifests itself in different world religions. 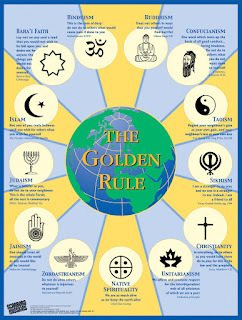 It's interesting how the general thrust is quite universal, but each religion gives it a slightly different spin. Native Americans, for example, speaks less of how we treat other people and more of how we should treat the earth. Some faiths go "negative" (like Hillel), as in don't do to others what you don't like done to you. Take a look at the chart below (click to enlarge), and imagine the globe in the middle as not simply the earth, but the ultimate Truth that all religions seek to locate. We are each coming from a different place, each giving the truth our unique shading. Ultimately, the hope is that we will meet in the middle, where the Real Truth resides.